Since the early mummification process was not a reliable one, the Ancient Egyptians covered the face of the deceased with a funerary mask that symbolically preserved the persons features. the first examples of mummification date to the old Kingdom (2686 – 2181BC), when the body was simply eviscerated, cleaned and wrapped first in bandages, then a shroud. In some cases, the linen bandages around the head were covered with a thin coat of plaster to emphasize the facial features, and the eyes, eyebrows and mouth were coloured with ink. From the first intermediate period (2181- 2055BC), the head was covered with a mask, usually made of inexpensive materials such as wood or cartonnage – layers of linen or papyrus stiffened with plaster. During the New Kingdom (1550 – 1069BC) metal masks, hammered out of gold leaf, began to appear. For the pharaoh, his family and certain high ranking officials, intricately worked gold plate was used, often inlaid with great quantities of glass and semi-precious stones. The deceased was believed to benefit from the precious metal, wich symbolized the incorruptible flesh of the gods. The first true mummy masks completely covered the head and upper part of the chest, and although rare in the first intermediate period, they were popular in the middle kingdom. Only the face , framed by a long wig, and the neck, adorned with a wide pearl necklace, were represented, while the rest was painted yellow or white. At the end of the middle kingdom, bulkier masks appeared. Dainty faces formed a contrast to long, heavy wigs. Beneath the necklace, a column of text indicated the name of the deceased. In the New Kingdom, masks were smaller and covered just the head and throat and occasionally the chest. Faces were less sterylized, but they still possessed a long wig and anecklace of strings of pearls. In the third intermediate period (1069 – 747 BC) and the late period (747 – 332 BC) funerary masks became increasingly small untill they covered only the head and neck. By the Greco-Roman period (332 BC – 395 AD), although Egyptian funerary customs remained popular, the overall shape and decoration of the mask had changed. The faces and headdresses had Egyptian gods painted on the sides, and the faces became more lifelike, forming actual portraits of the deceased. The discovery of the tomb Tutankhamun (1336 – 1327 BC) by Howard Carter in 1922 was one of the greatest in the history of Egypt. Among the young kings rich funerary equipment, Carter unearthed the magnificent mummy mask, made from solid gold with decorations in carnelian, obsidian, lapis lazuli and coloured glass. 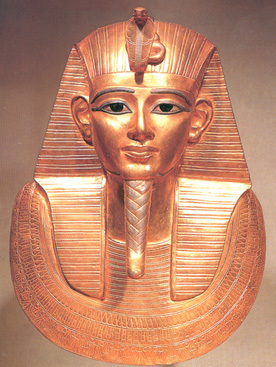 When Carter opened tutankhamun’s gold sarcophagus and revealed the mask, he saw a face with the features of a god. The Ancient Egyptians regarded precious metals and stones as divine materials, and their use in the funerary equipment of the king invested him with attributes of a deity. Gold, for instance, identified the pharaoh with the sun god, Ra. Of the spectacular treasures discovered in the famous tomb of Tutankhamun in the valley of the Kings, his mummy mask, now on display among the masterpieces of the Egyptian Museum in Cairo, is on of the most remarkable. Dispite his association with the heretical reign of Akhenaten (1352 – 1336 BC), Tutankhamun is depicted in the traditonal regalia of the pharaohs. He wears the royal nemes headdress, striped with lapis lazuli and hanging down on either side of his face. The uraeus, or Wadjyt cobra, and the vulture goddess Nekhbet, symbols of Lower and Upper Egypt, and th kings sovereignty, sit side by side on his forehead, offering him their protection. His false beard, which identifies him the gods, is worked in a framework of gold with blue glass paste inlaid to create a plaited effect. Tutankhamun’s expressive almond-shaped eyes are emphasized and extended by eye make up fashioned in lpis lazuli. The whites of the eyes are made from quartz, while the pupils have been inlaid with obsidian. touch of red pigment has been added to the corner of the eyes to create a lifelike impression. Tutankhamun’s parentage is uncertain his father may have been Akhenaten (1390 – 1352 BC). Although Tutankhamun is shown in the traditional idealized manner of the pharaohs of Ancient Egypt, the influence of artistic styles popular during the reign of Akhenaten is evident. The facial features notably the elongated oval of the face, the almond-shaped eyes, the long slim nose and soft, full lips are all typical of the Armana periods intimate expressive portraiture. Tutankhamun’s pleasant, youthful face is set in a sense, slightly sad expression.